Mindful awareness of physical and emotional attachment is the first step in both radical self-­acceptance and in creating a pregnancy, birth and mamahood narrative that is both healed and empowering. In this piece, yoga teacher and pregnancy coach Sandra Maurer provides us with five simple exercises we can use to support our clients on their journeys. Begin a career supporting women through the sacred time of pregnancy, birth and postpartum! Become a midwife orbecome a doula! One of my major concerns when working with clients is how they feel. Not just emotions, not just pregnancy complaints, but how they are thinking about those things, and how their bodies are responding to them. Conception, birth and postpartum are transformative times in our lives (arguably developmental times in our lives) and how we process and move through this season can have a profound effect on the rest of our lives and even our children’s lives. We know from research Annie Murphy Paul did for Origins that the 10 months of pregnancy impact the fetal development of babies. We know when our flight-­or­-fight response is heightened, other areas of our brain and body don’t function well (Yoga for Emotional Trauma). For mamas who have suffered pregnancy or infant loss, experienced a traumatic birth or sexual assault, the experience of pregnancy and labor can activate a host of emotional and physical challenges. Even if there is no major trauma in a mama’s history, our culture doesn’t support positive images or feelings about birth. Women are told they are “crazy” for attempting unmedicated or home births; pregnancies are micromanaged to the point of fear and exhaustion, and the simple process of searching for a care provider you feel comfortable with can disrupt the feelings of safety, security and love mamas need to rest and grow a happy baby. With each coaching client that comes to me before, during or after pregnancy, we try to pay attention to these physiological responses and the thought patterns they are attached to. Mindful awareness of these feelings (physical and emotional) is the first step in both radical self­acceptance and in creating a pregnancy, birth and mamahood narrative that is both healed and empowering. Where to begin with your doula/midwife clients? There are simple ways to help women access and honor feelings around birth. Depending on the mama you may choose to use multiple or one modality. We know that compassionate meditation and mindfulness actually helps us to regulate the anterior cingulate (that fulcrum that helps us connect our “thinking brain” and “emotional brain” so that we can make decisions not out of a place of fear but out of safety and love). ­ Suggest to your client 10 minutes of deep belly breathing while they focus the mind on a time someone nurtured or mothered them or was compassionate towards them. This can help reduce the flight/fight response and turn on the parasympathetic nervous system to bring on feelings of calm. ­ Invite her to breathe in and receive everything she needs, breathe out to release everything she doesn’t. If you’re not teaching a yoga class this can be a bit more tricky. But one of my favorite poses for helping mamas feel brave is supta bada konasana with props for support. ­ Prop up the upper body with a bolster leaning on a block so the bolster is at an incline. ­ Soles of the feet together and knees out wide, supporting each knee with a block. ­ Use a blanket rolled under the neck for added support. ­ Have mama breath in 3 parts (belly, ribs, heart or diaphragm, solar plexus, lungs). This pose can bring space and circulation into the pelvis, womb and heart. Opening the heart can feel scary ­ when we are anxious or afraid we cave the chest in to protect the heart and breath gets shallow. Propping up this posture helps it feel safe to release and open up. 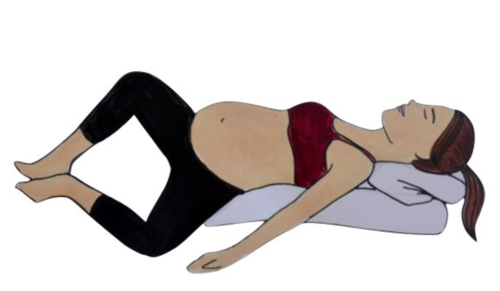 This posture is a great time for clients to visualize a positive birth, conception or postpartum experience. Our mirror neurons want to repeat what we’ve seen and it helps us to “see” something new. Invite mama to begin to visualize that event in detail: who’s in the room, what time of day it is, how they feel, the smells around them. If they have difficulty seeing something positive, help them to identify where they’re getting stuck and breathe through it. Is it when they lost baby last time? Are they stuck at the point when they had to transfer to a surgical birth last time? Is it the part where they feel like there’s huge unknowns? Where they believe it will be most painful? Are they feeling connected to their bodies or disconnected? If they are feeling fearful? Excited? Anxious? Where in their body are these emotions being stored? It can be hard to visualize what we’ve never seen. And sometimes we don’t even know this until we try to translate our hopes into a clear vision. ­ You after your empowering birth. ­ Your baby’s journey to you. Sometimes it’s hard to disentangle how we feel with how we think we’re supposed to feel. And birth is no exception. This is a great way to tap into our intuition and encourage it. One of my favorite tools I’ve recently introduced into yoga classes and with clients is Kind Word Massage. In this simple exercise that clients can do on their own, have them start by sitting and breathing. Then ask themselves “What do I need to be reminded of today? What do I need to hear?” Finding the answer, begin to self massage from forehead down the body (neck, shoulders, arms, rub belly, hips, thighs, calves, feet) and repeat that phrase over and over as they “rub it in”. Examples might be “I am loved”, “I am healthy”, “I can trust”, “I am beautiful” “My body is not broken”. “I am strong” or “I am supported”. These five simple exercises can set mamas on a journey of self-­discovery and self­-acceptance as you hold the space for them to process emotionally. They’re not bad to try for yourself as you process the burdens you carry from your own birth and fertility experiences as well as the ones you witness for others. May you have deep breath and radical self­ acceptance! Sandra Maurer, CD, RYT is a creator and guide at holistic retreats and workshops for mamas and mamas-to-be to empower women to getin touch with their embodied wisdom, reclaim the power of their femininity and experience motherhood as a sacred journey. A holistic pregnancy coach, certified Birth Arts International Birth Doula and registered Yoga Instructor with a B.A. in Art Therapy, passionate about helping mothers create holistic health mentally, physically and spiritually. She uses the mediums of birth art, nutrition counseling, herbal recommendations, birth education and prenatal yoga to support mamas on their journey. Want more women’s health education?